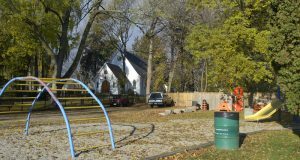 Elgin Park, located on Elgin Street between Burlington and Nelson, is undergoing a transformation, and the city needs your input into the design of the various parts of the park. The park includes a roads and parks maintenance facility, and a children’s play area. The park is also the site of an exchange with our partners in Apeldoorn, The Netherlands, who will design a portion of the park in our city, as we design a designated park in their city. Many residents have contacted me to indicate their interest in a continued play feature for children so that will be included in the new park design. A number of residents have been asking whether the roads and parks maintenance (RPM) facility could be moved out of the Elgin Park area. Council voted in November to retain the facility in this location; there were no viable alternative locations within a reasonable distance of the downtown, and the facility supports staff who take care of the downtown parks, including Spencer Smith Park, and Beachway Park. You can read the staff report here., which outlines other locations considered (see Items 5 & 6). I was prepared to bring a motion before council to reconsider the location of the RPM facility if a suitable alternative could be found. However, staff’s review of additional locations ruled these out for a variety of reasons, including overhead hydro wires which preclude building, the need for private land purchase (not budgeted), underground gas and sewer lines, reduced parking, or a combination of these. Thus, there is no viable alternative location close to the downtown, which essentially concludes any reconsideration discussion. Aerial view of RPM facility. The site layout and configuration of the building is up for discussion. Our task now is to seek public input in the best way to accommodate the three park features – the play feature, Apeldoorn involvement, and RPM facility. Interior roof of Elgin RPM facility, showing need for a new facility. To that end, I am hosting the Feb. 28 community meeting where staff will be on hand to listen to community feedback. The purpose of the meeting will be to seek your input into site layout, park design features, play space features, RPM building design and layout. Draft designs will not be available at this meeting. This is a community brainstorming session. Input from this meeting will be sent to staff and the architect as input into their designs. Proposed designs will be presented to the community for further input at an additional public meeting the evening of March 27 at City Hall. I hope to see you at both meetings. If you have any comments, suggestions or questions in advance, or can’t attend, please don’t hesitate to contact me with your feedback at meedwardm@burlington.ca or leave a comment below. My take: I understand the concerns residents have about the impact of the RPM facility, and would have supported an alternative location if there had been a viable site. I believe that we can mitigate the impacts of the facility through good design and site layout, and look forward to working with the community to revamp the park and incorporate all three features. the city has not once cleaned in twenty years, we are taxed every time we spend. When will this city ever stop with the over spending on nonsense. great example..six-metre-tall bronze UGLY SCARRY sculptures of wild orchids?? ?